Lagon Reunion resells its own Transparent Kayaks, shipping all over the world. Make your business more attractive with this original product ! We are manufacturer and supplier of Transparent Kayaks. Lagon Reunion has commissioned the best manufacturers and engineers in the sector to offer you innovative and reliable products. All our products are guaranteed for one year. Made entirely of high-end transparent polycarbonate, this kayak with a sleek design will allow you to admire the seabed up to 20m deep! Ultra resistant and super stable, it supports up to 230 kgs. The feeling of sliding and its adjustable seats will offer you unique comfort and unforgettable rides. Its weight is 16 kg, it measures 80 cm wide, and 340 cm long. 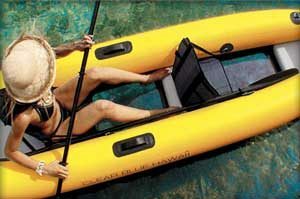 The kayak comes with 2 seats, 2 paddles, 2 flotation flotation. It takes 35 days for delivery. The practical and affordable transparent kayak version. Carry it in your trunk, inflate it and embark! Ultra stable, unsinkable, this kayak will adapt to all conditions. Its weight is 25 kg, it is 94 cm wide, and 420 cm long. The kayak has a transparent window for each passenger. It takes 30 to 50 days for delivery. Solidity of our Transparent Kayaks?